Many thanks again to all of you who submitted your radio holiday memories in our December contest! In the end, we had over forty entries and I’ve truly enjoyed reading each and every one of them. In the spirit of the holidays, and to conjure up some serious radio nostalgia, I’ve posted all of the entries below. Mind you, this is a very long post. Typically, I would embed a number of photos and graphics, but I want this to be easy to read on mobile devices and not too bandwidth-intensive for those who subscribe to our email feed. I included all of the actual stories submitted. If somehow I left yours out, please contact me or comment here and I will add it! Now grab a cuppa Joe, tune your radio to some holiday music, tune out the world and enjoy these wonderful stories! Thank you all again! Here’s wishing you Happy Holidays! In 1970, I went to the ARRL convention in Boston. There was a Heath GR-78 that I was impressed with, but the price of $169.99 was my life savings and then some. When Mom asked what I wanted for Christmas, I shown her the heathkit catalog all bookmarked. She then shown it to Dad who at least said to Mom he is not asking for a car or motorcycle for Christmas. Mom said I can park that idea in the garage of my imagination. Dad was nonplussed about buying a kit that you had to put together at that price. Later in the year, Dad found a Hallicrafters S-20-R in a yard sale and got him down to Twenty bucks. I had that radio for 15 more years and sold it for three times hat price. Fast forward to the present where I found this GR-78 all in pieces for Fifty cents. I got it mostly working, needs more work, But I certainly can get more that a buck fifty today. Both Mom and Dad would be proud of my choice today. I remembering going over to my grandmother’s and uncle’s house on Christmas eve and many other days to listen to my uncle’s radio. I would be there for hours on end. Don’t remember any programs themselves. After a couple of years I ended up buying my own portable radio, but I still would go over to share the hobby with the man who got me into it. Well years later now I have 2 of my uncle’s radios since he has passed on. Everytime I listen to them I always think of my Uncle David RIP. Love ya. I remember my folks going away on vacation in December and leaving me at home alone. I took the opportunity by visiting a local Radio Shack and buying a shortwave receiver. I also set up a long wire antenna from my bedroom across the back yard. I sat up several nights tuning the dials trying to catch some rare DX. I don’t remember hearing any exotic stations. I do remember my Dad returning home and letting me know that he thought the radio purchased was too expensive. So I returned the radio to Radio Shack. Now the radio is gone…my Dad too but the memories remain. That was 46 years ago and I am still listening to shortwave radio. One of the main advantages of the Christmas holidays for me as a High School student in the late 60s was the opportunity to stay up late to take advantage of good winter conditions on the Tropical Bands. I remember coming home from a Friday night showing of The Graduate – this would have been 1967 – and settling in for a long night in front of the warm glow of my Hallicrafters TW-1000. It was really late – maybe 0900 GMT, which was 4 in the morning local time – when I heard ABC Port Moresby, Papua New Guinea on 4890 kc/s. The QSL that arrived a few months later brought back the warm holiday feeling, and I can recapture the same feeling today when I look at the card. My SWL “career” all started with a little GE transistor I got for Christmas in 1966. At night I listened to Canadian stations across the border from Detroit. Some broadcasts were in French. They sounded quite exotic to me. 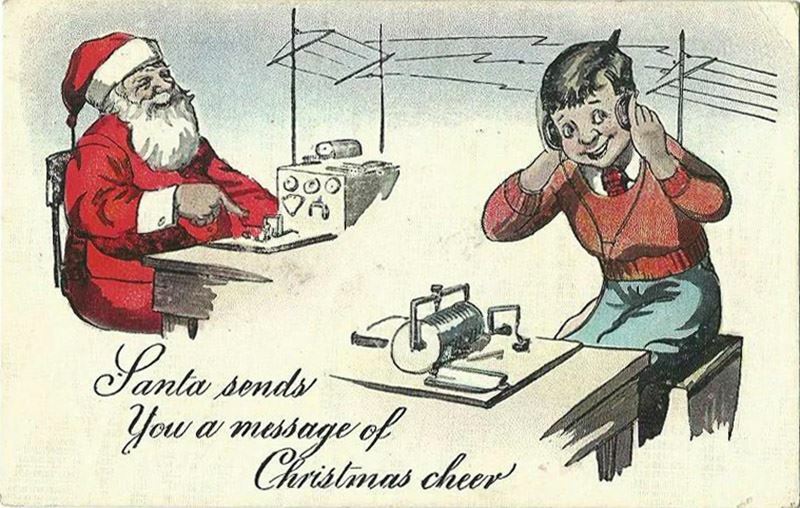 When I graduated to HF receivers I looked forward to listening to the Queen’s yearly Christmas message on shortwave. Now each December I search the bands for Christmas music and sit back enjoy. My old man owned a taxi business and every Christmas eve he would have my mother bring us to the office. He would then have one of his drivers pretend to be Santa over the air. We loved it so much….Sometimes if we couldn’t get to the office he would send a driver to the house and we would use the car radio. He told us he had a special radio that could reach Santa and those were some of best Christmases I ever had. I also remember one Christmas my old man bought us our first CB….what a gift. He had a antenna guy install our antron and we were on that thing every day when we got home from school. I received my first shortwave radio for Christmas 1972. A Radio Shack ‘Astronaut 8’, AM/FM/SW/VHF radio. A rather large radio for a portable, using 6 ‘D’ cells for power. These were the days long before the internet, when Shortwave was one of the few ways of listening to foreign lands. As a teenager, this was pure magic! The tuning on the radio was a little stiff, but with care I listened to Radio Peking, Radio Moscow, HCJB Voice of the Andes, AFRTS (American Forces Radio and Television Service) & Voice of America. And probably many others I’ve forgotten. The SW bands were really crowded back then, many stations to choose from. I went on to use other radios over the years, but I still have the ‘Astronaut 8’ and it still works. A 15-year old kid was roaming around the public library when he came upon the “radio” section. (Yes, there used to be a radio section.) He checked out an ARRL Novice study guide. Months later, he took the test & got his license. But, sadly, he had no money to buy gear. More time passed and he had almost given up on the idea of ever calling his first CQ. Then, on Christmas morning 1966 that kid (me) woke up to find a Heathkit DX60 transmitter and Hammarlund Super Pro receiver under the tree. I’ve been on the air ever since. That Christmas gift from my folks led to a hobby that’s lasted for 50 years. For Christmas 1964 I begged enough and Santa Claus brought a Knight Star Roamer, my first SW radio. I couldn’t have been happier. I think it even worked the first time I turned it on! The following Christmas I got a Trap Dipole tailored to the SWL bands. The Star Roamer led to about 50 QSLs and then to a Heathkit SB-310. I still have the Star Roamer, the antenna and the SB-310–and they work. Listening to the Voice of the Islamic Republic of Iran on Christmas Day, shortly after the start of the second Gulf War in 2003, and hearing them send greetings on the celebrations for the birth of the prophet Jesus Christ. Certainly changed my attitude to Iran and made my question how and why religion appears to be the cause of so much conflict. Last year started listening to SW radio at my Grandpa’s place on his old Panasonic MW/SW radio. I had a very little experience of radio antenna but I hanged a long wire on terrace and started radio listening it was 1st december when a seasonal broadcast from pakistan started all about life of God Jesus . There were many religious programs on same frequency in sw band . One program was there which tell a little part of life of jesus and then put some question from the story and the price for winners were new sw radios . I participated in all programs but never get a chance to win a SW RADIO . But I spent a good holiday with my grandparents . And in hope to win a good radio as still i am using the old radio for swl. THANKING YOU. Have a enjoying christmas holidays and happy new year. As a child (64 years ago), my older brother got a huge Zenith console radio which had shortwave bands. During Christmas Eve we listened to the local police on the SW band for hours until it was Christmas. That was my introduction into SWL at the age of 6. Still love those big old radios but also love the new high tech small radios. New Year’s Eve many years ago (more than I can remember) I we were staying with grandparents. As I was tired and probably too young to be staying up late I was put to bed. I decided as I couldn’t sleep anyway I’d listen to the radio. I tuned the MW/LW bands on a Phillips D.3142 radio and picked up the local Taxi Rank! The boss called for all drivers who had not got any passenger to return to base to have a glass of Champagne! This got my interested in communications and the next week I purchased an “Airband” radio which was pretty much useless. I lost interest not long after, but I’ve been listening to Shortwave for the past four years and have recently got my foundation amature radio licence! Still have the Phillips radio, and still remember where it all started! Oddly enough I was only just talking about this a few days ago. You see this takes place many Christmases ago when I was only 10 years old. At the time I lived in Greece with my Mom and Dad. This particular Christmas was a very windy and rainy one and being that we lived on a small island, this kind of weather left us prone to power cuts. So that’s exactly what happened! I think it was just after Mom had finished frying a second batch of bacon. Now normally on Christmas day we sit around the telly and watch our shows while we wait for the turkey to finish cooking. However this year we had to cook the turkey on the fireplace and instead of watching television my Dad brought in his old radio receiver. (Sorry I don’t remember what model it was) Now I was familiar with AM, LW and FM but at the time I didn’t know what SW was. So this was really my first time tuning into Shortwave and boy the was so much to listen to! The Vatican was broadcasting hymns, stations all the way in America where broadcasting Christmas oldies I had never heard of. We lived outside of town and with the power cuts, you can Imagine how clearly everything was coming in. The whole world was at my hands at the quick turn of a knob. It think I spent the rest of that day drawing and cutting out paper hats. It’s not an exciting story but it’s certainly stayed with me all these years. I started my radio electronics hobby when I was at Primary 5 in the 60′ in Hong Kong. One day after school; on a side walk sale stall, I bumped into a second hand book about transistor radios construction with lots of diagrams and pictures of physical electronic components showing how to put together a working transistor radios. Now, more than half a century later, I am still hooked. Back in November 1982, when I was working in Malaysia, we decided to go to Tahiti for our holiday. When in Tahiti we of course heard RFO Tahiti with the typical Polynesian music and rhythms. After spending about 2 weeks in Tahiti we went back to Malaysia and a few months later, in February, I managed to hear RFO Tahiti on my DR-28 and of course I wrote a reception report, which was verified. In 1991, almost 8 years later to the day for my report from Malaysia, I managed to hear RFO Tahiti on the same frequency (15170 kHz) in Sweden an early morning. It was the same lovely music that came out from the speaker as in 1983 and I sent a report, and again I got a verification. So when I look at my QSLs from Tahiti, they always brings back the nice memories from the holiday in Tahiti! I was born and lived in the 60’s for a long time in Ponza Island, an island in the Tyrrhenian Sea in central Italy. When I was 6 years old, I went every day to the house of my maternal grandparents who had little room in the kitchen a Telefunken radio model Domino. I remember that under the Radio shelf there was a chest where I could listen to the radio and to turn the knobs. How many great memories of distant voices that even though I did not understand the language left me in something nice and far away. How many nights I spent in the dark, often sleeping in the chest, I like small light green magic big eye … how many distant voices I heard trying to understand why he could operate a radio. I remember the large display with all the names of the cities of the world, I had just learned to read and turning the tuning knob passed from city to city with an ever different language. The evening before dinner my grandparents tuned Rome to listen to the radio news, no one had television, and to be together around the radio was really beautiful. Early in the morning, I remember, because I listened to my father’s time bulletin went fishing and wanted to know from me if the sea was rough … I have learned to take the first right clipboard getting the weather bulletin. These are my memories in my memory, and now after 50 years are still present. I have so many radio today, I became a ham radio operator, and I never lost the habit of listening, listening and always listen to the radio. Excuse me for my English but it has been translated by Google. Grazie a tutti from Ponza Island, Tyrrenian Sea, center Italy. My Christmas memories center around my Uncle, a government Geologist from Canada, coming home to Boston for Christmas. As children, we would gather at his feet while he scanned to shortwave bands on our Zenith floor model radio. He told us stories of his travels to the Arctic and Antarctic. As voices came thru the magic of radio , he explained what life was like in Northern Canada and many other places while tuning the bands to voices and music from those parts of the world. For my brother and sister, it could have been about another planet far, far away . I will never forget his stories, the sound of the radio and his voice. He was my hero, a real-life “Indiana Jones”. May he rest in peace. It was Christmas of 1980 and I was a freshman in high school. Years before my dad had been into radio but had sold all of his equipment, but I found books and magazines in the basement (from the 60s) that sparked my interest. I asked for a shortwave receiver and my parents gave me a Radio Shack DX100. Even though it pales in comparison to even the pocket-sized technology we have today, that radio opened up an entire world to me. I became a HUGE SWL and enjoyed listening to broadcasts from all over the world on that radio. In retrospect it really exposed me to information I otherwise could not have had access to in those pre-Internet days. My specific holiday memory was from the very night that I opened up the new radio. Our family was spread over a wide geographic area and it meant spending “Christmas” visits at multiple homes on both Christmas Eve and Christmas Day, and lots of time in the car in between. I distinctly remember getting in to the car that night and of course the radio was with me. On battery power and with the telescoping antenna covertly extended out a mostly-closed window, I cruised around the bands while on the way to my grandparents’ house. Somewhere along the way I stumbled onto a Christmas mass service being broadcast by Vatican Radio. Hearing that now is no big deal, but to me at the time it transported me across the ocean to St. Peter’s Square (a place I wouldn’t visit until decades later). This was the first occasion of something that would happen many times as a lifetime radio listener, and made for a very strong holiday radio memory. Best wishes to everyone this holiday season! When I saw the idea for the contest, I immediately know the story I would tell. Nothing brings back memories like spending time with your grandparents and I was fortunate to have spent quite a bit of time with mine. My grandfather was pretty well to do and he would always buy the best of what ever it was. He also liked to do a lot of traveling. To keep up on worldly events, he had an amazing radio on his desk in his study. To a child, it was an amazing radio! There were lots of buttons to push and had a very complicated dial. It also stunk! When ever my grandfather would turn it on, a very odd odor would come from the radio. Back to the dial… I can still picture the dial as if the radio was next to me right now. It had all kind of numbers and markings in an unusual typeface. But the thing that amazed me, was the city names printed amongst the numbers; Berlin, Paris, Rome and others. He always had it tuned to Berlin and would listen to Deutsche Welle. Sometimes, when he was working on some paperwork, the radio would continuously play the same short 15 second “song” over and over for what seemed like hours before we would hear different music or a man reading the news in German. (I would later learn what an interval signal was!) One of these evening listening sessions sticks out in my mind and it is a memory that I will never forget. The whole family was was at his house as It was Christmas Eve and sitting right next to his radio was a wrapped box with my name on it. He had gotten me a small shortwave radio of my own! We plugged it in, let it warm up and turned it to where it should have said “Berlin” but only had numbers and loud and clear we heard the old familiar music. Many decades have past but it’s a little personal tradition for me to sneak away from the family and commotion of the holidays to tune into “Berlin” and listen to a little holiday music from Deutsche Welle’s interval signal. As a kid we would drive a couple of hours every christmas to visit family. The car radio was always tuned to CBC christmas program which usually is a talk radio, but for the occasion was always broadcasting Chrismas music. I will never forget getting a Radio Shack DX-60 Shortwave receiver for Christmas in 1982, my senior year in high school. One of the first programs I tuned into was the Happy Station Show on Radio Netherlands. I have been hooked on shortwave and amateur radio ever since! Many holidays have passed since then, but that one stands out as one of the best in my memory. The radio still works today! This story goes back to my early youth and happened one Chanukkah (1965 to be exact!). My grandfather spent 50 years as a bread delivery man for Wonder Bread in New York, and in 1948 received a Zenith Transoceanic Clipper Radio (8G005) as an award for 15 years of safe driving (there is a nice metal tag on the top of the radio commemorating his achievement). Whenever I visited my grandparents in their Bronx apartment, I would wander over to that radio, fascinated by the cool dial, huge telescoping antenna and the strange foreign broadcasts I would hear. In 1965 my grandmother passed away and “Gramps” came to live with us – not an easy thing for an 8 year old kid to deal with. Gramps remembered how fascinated I was with the radio and that year gave me his prized radio as one of my gifts for the holiday. I immediately asked him to show me how to use the radio, and that act of love helped lead me to a life long love affair with shortwave radio (which was soon followed by early crystal controlled scanners, but that is a whole other story!!). I still have Gramps’ radio in my basement, along with a few more vintage radios that I bought over the years. The warm glow of the tubes and rich sound of the foreign programs still send my heart racing on the rare occasion that I fire up the old rig – I love my modern radios, but similar to listening to CD’s or MP3 files vs. my old vinyl Records, sometimes there is nothing like the old technology to bring back the excitement I felt as a youngster! Fondest memory of radio: Christmas Eve, 1975, when I made my first contact on CB using a crystal controlled Midland walkie talkie while driving home on the New England Thruway after visiting relatives in Brooklyn, NY. Hearing someone getting back to me after saying “Break 19 for a radio check” was a real thrill. The antenna was a gutter mount center fed whip. It’s now 42 years later and still have an vintage CB radio in the car and a FireStick antenna. Thank you Thomas and Fred at Universal Shortwave (still sending out those great catalogs!) for sponsoring the contest. Recently in Delhi India i got an opportunity to join the RTI (Radio Taiwan International) listener’s meet. I think it was a wonderful memory of the holiday season. The things we fellow radio listeners shared and the interaction with RTI team members is unforgetable experience. The interactive session with RTI team was focused on RTI broadcasts and the current practices in radio broadcast in general. The listeners are worried about the deplating radio stations on the analog shortwave. DRM was also discussed. we generally felt that DRM is still evolving and its expensive radio sets are one of the major concern because most of the people here can’t afford it. Overall this meet ended with a satisfaction from both sides with a promise to have such a successful meet again. Ms.Paula Chao, Head of English Language Section, Radio Taiwan International. Many decades ago living at home, I had set up a workshop/shack in the basement, where I would attempt to repair old radios I had acquired. These radios were usually the console types that had the green eye tuning indicator. As was the case the cabinets were set aside and I would have just the chassis on the workbench or shelf, the speaker was usually sitting off to the side. My antennas were ones I had dreamed up or made by following plans. My earth ground was convenient, as the water main came up through the floor. The basement was cool but not overly so, as the boiler pipes ran through this small room that had at one time been a canned goods storage area. It was a cold winter vacation period just before Christmas yet it was pretty much just another day in the life of a teen back in the 60’s. I had powered up this multi band RCA tube radio that had pretty good reception, but I wanted to try out my new “pine tree” antenna that towered above the corner of my parents house. This tree had been a climbing tree for many years and it was fairly easy to get to the top of it, so I had run some wire up as far as I could thinking to myself this may not work very well being shrouded by the branches. Well, that turned out to be a great antenna for lower frequencies. I tuned a station playing a song by The Ronettes titled Sleigh Ride, the radio station was WABC I think, but it was that recording and the fact it was from New York city. I was in Milwaukee Wisconsin, sitting in the basement, pleased as a young man could be and somewhat in awe of it all. Christmas and the end of the Year are always a special time for SWL listening, especially because there are many contest for all the listeners. For example, I remember these kind of contests from “Radio-Enlace” and “Happy Station” (in the Spanish Service) of Radio Nederland Wereldomroep with Jaime Báguena and Alfonso Montealegre. They usually made a raffle between all who have sent a postcard with greetings for the program. And in “Radio-Enlace” they mixed the sound of many interval signals and who had discovered the name of these International Broadcasting, entered in a raffle for many “World Radio and TV Handbooks” as prize. December is also a special month for Radio Prague. They still make contests about Xmas traditions in the Czech Republic, with crosswords, questions, etc. This year many stations prepared this kind of contests for their listeners… But in this Internet age, mostly of them consist in posting a picture of the Christmas tree of your town on Facebook. I think its the winter effect or something else..but I am able to get VOA English service here in India (they now broadcast for Africa) many many miles away. It’s really thrilling the hear “borders crossing with Larry London” after almost a decade. I am not a tech savvy person and know about radio stations. but antennas and other tech stuff involved in radio is not my cup of tea. I have a simple Tecsun PL 660 radio and I use only telescopic antenna. so listening to VOA these days is really a delightful experience. because VOA now a days don’t broadcast towards India. I hope to DX more stations in future. I was about 11 years old (1965) and I received a oversized “Spy/Secret Agent Pen” which with much manipulation transferred into a crystal radio. The barrel unscrewed and an alligator clip was attached to the cold air return and the clicker was the tuner/antenna. With a very small ear bud I could listen to radio all night long,anytime I like to. My father, who bought me the radio cleverly/miserly didn’t have to by any batteries as for a transistor radio. The radio only received one station,but it was fine as it was mine and I had reception all the time every time. it was a Great Christmas that has lead to a lifetime of radio(s) every night,with each Christmas night very special. When I was about to turn 7 years old (I think this would have been in 1983), I was hoping I would get either a clock radio or a calculator watch for my birthday. So my grandma Roberta gave me a $20 bill and told me I could get one of them as my birthday present from her. Unfortunately the day that I was to go to my favorite store (Radio Shack) I started itching. My mom took me and my brother to the doctor and they told us we had the chicken pox! But luckily for me (and possibly unlucky for anyone in the store), we stopped by Radio Shack on the way home. And after lots of deliberation I picked out a Realistic brand clock radio, with the simulated walnut finish. I loved that radio and played it every night when going to sleep. Sometines to music but in time I learned that I could tune into far away stations like WLS in Chicago (a pretty long hop to my clock radio in Oklahoma). In the coming years I would also get to listen to history (I remember staying up all night, secretly, listening to the coverage of the Russian military coup when Boris Yeltsin stood up on the tank. But there were fun moments too… especially after I discovered the irreverent fun of Doctor Demento. Lots of memories… and made all the more poignant because my grandma died of cancer 2 or 3 years later after that birthday. It was 1979 and I was 8. That Christmas, we flew out to Southern California to visit my aunt and uncle. It was my first time flying, and my first time meeting them. My uncle was an early electronics geek. His garage was filled with all sorts of components and gear. As an extra Christmas gift, he gave me an AM/FM transistor radio in a silly plastic “hot dog” case and told me about how if I listened to AM at night, I might be able to hear stations from hundreds of miles away. That night, I stayed up late and heard KGO in San Francisco, and a couple of others I didn’t catch the call signs of. After getting home to NY, I would hide the radio under my pillow and tune around the dial to find the furthest station I could. Now in 1979 the TV show “WKRP in Cincinnati” was on & my parents and I watched it. Imagine my shock when tuning the dial on this little radio when I pick up a station in Cincinnati! 850AM. Wow! Unfortunately, after about 20 minutes, the station faded, but I was wide awake. I snuck out of bed and found our atlas to see just how far away Cincinnati was – 600 miles. At school the next day, none of the kids believed me. That silly hot dog radio led me to getting in to shortwave radio, getting my ham ticket, and becoming an engineer. But above all, I’m still hooked on medium wave DXing, and to the chagrin of my poor wife, still sometimes hide a radio under my pillow. My favorite radio memory was when I was in high school and was listening to the local police department on Christmas Eve, and the dispatcher was slightly complaining about having to work instead of being home with family. It lasted about 10 minutes, and is still one of the best things I’d ever heard on the police band. The Happy Station Christmas Show back in the 1970’s – fun listening to that and others as I remember on an old Zenith Trans-Oceanic Royal 1000c – Loved that radio. I started repairing old multi-band 1930’s vintage radios that resided in people’s attics. One lady had two radios. I told her I would I would fix one and trade the second for the repair. She agreed and I wound up with a Wards Airline. The case was in bad shape, but the radio wasn’t. I don’t remember what the model was, it had a frequency dial with finger holes around it’s circumference. The speaker line supplied voltage to the original speaker, which was cracked and broken. So I had to isolate from the voltage via choke. After other repairs, I added a BFO. We used to salvage old TV’s that were discarded for parts. I had done BCB listening, only way to get rock and roll in the Upper Midwest at that time. But now the world was out there for me to hear. Many nights were spent listening in my basement. The BBC and Quito, Ecuador were the really strong signals. I only had a longwire antenna. i was only 12 at the time and didn’t have a lot of money. The nights spent in the basement showed me how good it was to hear foreign news and music. I trolled the Ham bands also. SSB was new and most stations were AM or CW. They’re fond memories, I could travel around the world via radio. Eventually I got my Novice ticket and used the Wards for a receiver. I still SWL on my Yaesu FTDX3000. Eventually I got my Novice ticket and used the Wards for a receiver. I’ve used Hammarlund, Hallicrafters, Heathkit and Icom since then. I still miss the zero beating the signal and using a marker crystal to accurately get the frequency accurately. The comfort of the tubes warming you in the chilly basement; probably my imagination. Now, at 70, it’s still fun ! It was amazing moment. Several years ago, on the eve of the New Year, I have listened to “pirate” program of Radio Waves International from Latvia’s transmitter. Of course I have sent the reception report to this radiostation, and attached postal card with the photo of my town. A couple of weeks of waiting – and the parcel from France is in my hands. My joy was great! There were a special CDs, QSL-card and booklets in the parcel. Rare recordings – on the first CD and beautiful music – on the second. Many thanks this radio station for the holiday gift! WOW! The year was 1971 and the memories of my many visits to the Hygain factory in Lincoln, Nebraska to see the blue label beauties of the Hygain Galaxy R-1530 receivers being assembled flashed back through my memory as I gloriously browsed the recent Hygain advertisement of the unforgettable Hygain R-1530 and it’s companion speaker SC-1530. I had worked super hard during the school year and earned enough to order one of these blue beauties. My heart palpated when I unwrapped my box while sitting under the real 6 foot Norway Spruce tree. Santa had been extra good to me this year and I was eagerly waiting to experience an unforgettable night in my life. After unwrapping the two boxes, I quickly took the receiver and speaker into my bedroom and placed both on my school desk.The magical mystic adventures began as I meticulously tuned the shortwave bands. I immediately fell in love with my brand new Hygain Galaxy R-1530 and SC-1530 station. This night was so memorable in so many ways as this transistorized boat anchor unlocked my knowledge to the world. I kept this blue beauty until my early college days and the marvel faded away. Today, I have been lucky enough to own three of these unique receivers. The marvel has returned after 45 years and the candle is once again lit! What more could a guy ask for? Merry Christmas to all and create your own memories during this holiday season! I was 13 and times were tough. The only thing that I wanted for Christmas was an AM-FM clock radio, the type with number panels that flipped down every minute to reflect the correct time. (This was before LED digital clocks.) I don’t know where my parents found the money, but my wish was granted. Having grown up in a rural area of northeast Florida (the nearest neighbors were over two miles away), the radio opened up a whole new world to me. Though it was only AM-FM, I quickly discovered that I could DX AM stations at night and was excited to receive clear signals from WBT in Charlotte, North Carolina; WWL in New Orleans, Louisiana; and even from KSL in Salt Lake City, Utah, on one fine occasion. DXing AM led to my interest in DXing shortwave and I bought my first SW radio set 10 years later. I’ve enjoyed a lifetime of listening to the voices of the world and it all started with that little Christmas clock radio that I had hoped for but never expected to receive. Many years ago I was driving to NJ from Penn for Thanksgiving, and came across a 2 meter net with several friends that I knew from ABC News in NYC. I was very happy to hear from them, but suddenly a gentleman came on asking for folks to check his audio because he was in the midst of repairing a radio. I immediately jumped in (audio was fine) and struck up a conversation about the old Model 75 RTTY terminals that some friends of mine were restoring. Turns out ‘Walter’ was very familiar with this equipment and gave me a great deal of info. I also noticed everyone was VERY deferential to him, and wondered who ‘Walter’ was. Well as I pulled into my driveway, I wished everyone a happy Turkey Day, and Walter said ‘Good Evening Mike and Happy Thanksgiving’. I immediately knew who I was talking to all that time – the late Walter Cronkite, who was a well known ham and rarely used voice comms (he was a big CW fan). 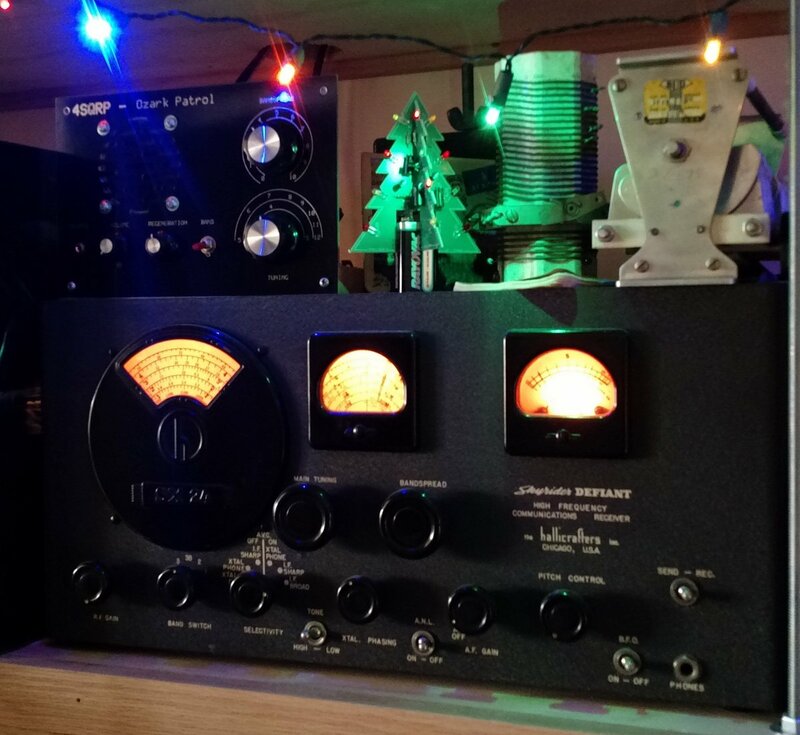 This entry was posted in Contests, Guest Posts, News, Nostalgia, Radio History, Radios, Shortwave Radio, SWLers and tagged Contests, Holiday Radio Memories, Holiday Shortwave, Nostalgia, Radio Memories, Radio Nostalgia, Shortwave Memories, Universal Radio on December 24, 2016 by Thomas. Winners of our holiday radio memories contest! Please join me in congratulating Renaud Hardy and Bill Murray (AF7WM) who were picked at random out of the 45 entries in our Holiday Radio Memories contest! 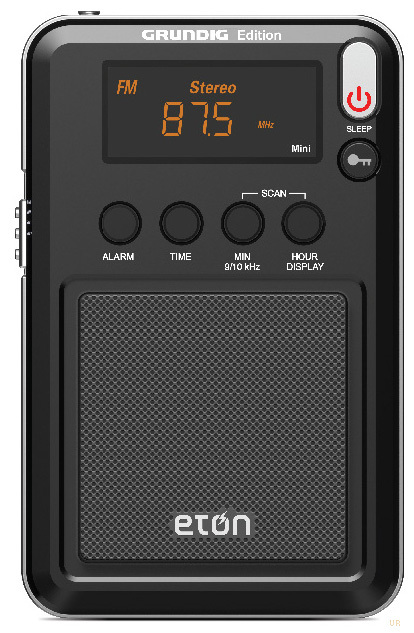 I have notified both winners by email and Universal Radio will soon dispatch their prize: the Eton Grundig Edition Mini portable shortwave radio! Thank you, Universal Radio, for sponsoring our December contest! I’m going to format a large selection of responses and post them by December 24th here on the SWLing Post. And trust me–you’re in for a treat! Many of us can relate to these memories! Stay tuned! This entry was posted in Contests, News and tagged Contest, Holiday Shortwave, shortwave on December 19, 2016 by Thomas. December Contest: Your holiday radio memories! My Hallicrafters SX-24 in the holiday spirit! It’s the winter holiday season here in North America, typically a great time to slip into the shack, sip some warm mulled cider/eggnog/coffee, and explore the world via the shortwaves, mediumwaves, and longwaves. Truly an experience of comfort and joy. Fred Osterman at Universal Radio contacted me recently and offered to support a little contest to celebrate the holiday season–with a little gift! 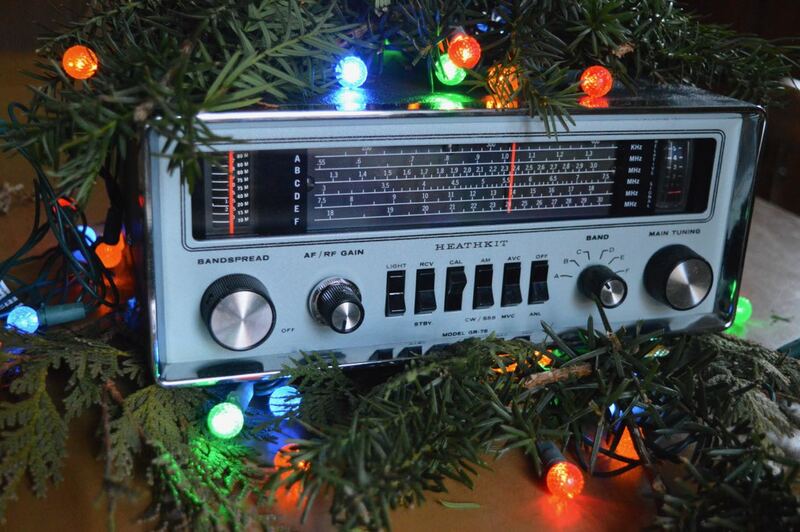 Do you have any special holiday memories that involve…well, radio? Perhaps you remember a seasonal broadcast, received a special radio as a gift, or otherwise enjoyed the holidays through radio? Please share your story! Of course, this contest encompasses any holiday–Christmas, Chanukah, Kwanzaa, Ramadan, Easter, or any other religious or secular holiday in which a particular radio memory played a part. We’ll select a number of these memories and share them in a post here, just to put us all in the holiday spirit. Universal is offering a handy Grundig Edition Eton Mini to our US winner and another to our international winner! Merry, merry! Simply fill out the form below (or by clicking this link), and share your story. Please only enter this contest if you’re willing to share your story with others. This will be a short contest: all entries must be received by 00:00 UTC on Sunday, December 18, 2016. We’ll announce the winners, picked at random, on Monday December 19th, 2016, and the holiday prizes will be shipped the same week. We look forward to your holiday stories! A special thanks to Universal Radio for sponsoring this holiday contest! This entry was posted in Contests, News, Nostalgia, Radios, Shortwave Radio and tagged Contests, Etón Mini, Holiday Shortwave, Universal Radio on December 14, 2016 by Thomas.